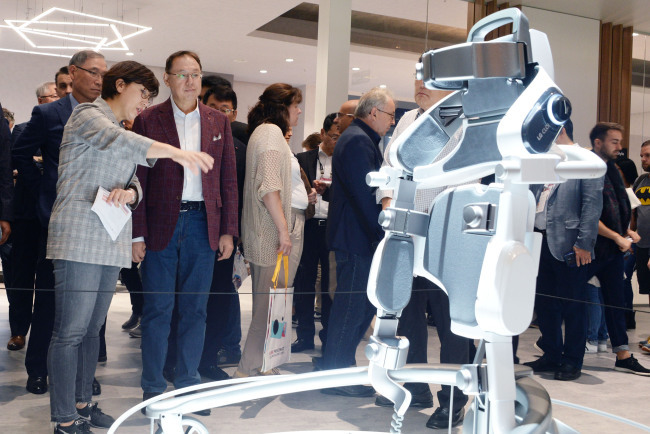 BERLIN -- Jo Seong-jin, vice chairman and CEO of LG Electronics, hinted Friday that the South Korean home appliance manufacturer wanted to forge a partnership with Nvidia to develop applications for autonomous driving. The LG CEO told The Korea Herald on the first day of the IFA 2018 in Berlin that the company could join hands with leading autonomous driving solution companies like Nvidia as part of efforts to expand its vehicle component business. “Firms like Nvidia are taking the lead in developing autonomous driving solutions. We could consider purchasing their solutions in order to make better applications,” he said, without elaborating. LG has been working on applications for self-driving including a next-generation telematics solution. Late last year, the tech giant said its telematics division was partnering with Here Technologies, a global provider of digital mapping and location services, to provide high-precision map information. The company also develops next-generation displays for cars, using organic light-emitting diode technology, as well as algorithms that process moving images collected from cameras. Aside from selling motors for electric vehicles and infotainment systems for premium automaker brands, the LG CEO is eyeing autonomous driving, an area in which he believes the company can contribute to the connected car industry. After making losses for the past five years, the vehicle component business is striving to turn into the black this year. The LG chief will fly from Berlin to Wieselburg to visit ZKW’s headquarters Monday and meet with the automobile headlamp maker’s top brass for the first time after LG completed acquisition of the Austrian firm for 1.1 billion euros ($1.28 billion) last month. “I am visiting ZKW to welcome the new LG family and introduce myself to them in a bid to start working together from now on,” he said.